Carolyn Woo grew up in a refugee culture in Hong Kong, where millions fled the Communist revolution. As early as the fourth grade, Woo translated utility bills and tax notifications for relatives who were unable to read English, the official language of her native country. Dinner table conversations featured stories of acquaintances who had lost material possessions, social positions and professional credentials. Woo, who enrolled at Krannert at the age of 18, packed her undergraduate industrial management education into three years and continued graduate studies in industrial administration, completing 53 hours in 11 months. While earning both her master’s degree and a PhD in strategic management, Woo was forced to think more clearly, write more precisely, argue more persuasively and make a higher commitment to excellence. She went on to join the Krannert faculty and left her position as Purdue’s executive vice president for academic affairs in 1997 to become dean of Notre Dame’s Mendoza College of Business. 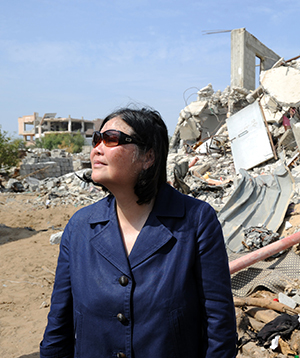 From 2012 to 2016, Woo headed an organization – Catholic Relief Services (CRS) – that started 70 years ago resettling refugees from war-torn Europe and remains fully engaged in responding to the plight of displaced people. Woo led CRS using her quarter of a century experience gained at Purdue’s Krannert School of Management as a solid foundation. Her global treks included leading CRS delegations to Ethiopia, Haiti, and Iraq. In 2015, Woo was one of five presenters in Rome at the release of Pope Francis’ encyclical on the environment. Woo’s memories as a student, faculty and administrator at Krannert and Purdue run the spectrum, helping shape the four points of her own professional compass – commitment to excellent teaching, innovation, rigor and generosity. Those guiding principles remain part of Woo’s fiber. She says Krannert “stood out for its bold, innovative, and industrial-strength research methods requirements” and that she particularly benefitted from the faculty investing in students and each other’s success.